Today Jess combined two great sets to create an awesome masculine birthday card! 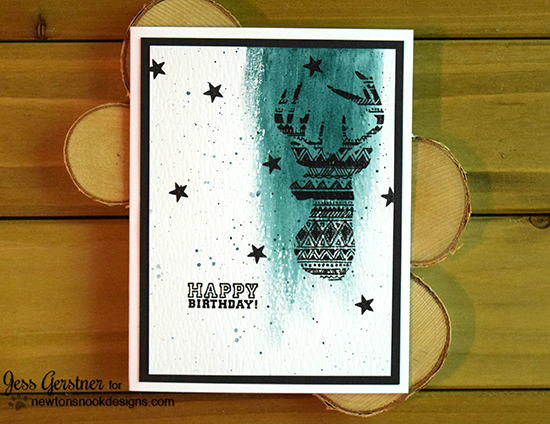 She used the image of the deer with all the fun geometric patterns on him from our new Adventure Awaits stamp set as the focal point on her card. I love how she has a fun watercolor wash behind him! Then she added in the "Happy Birthday" sentiment and little stars from the Touchdown Tails stamp set! I never would have thought to combine these two sets and I LOVE how they look together! Plus, this is all stamped in black so it would be simple to make a bunch of these birthday cards to have on hand. If you're anything like me, you never have enough birthday cards! What a classy and cool card for a gentleman who likes to hunt!! Well done!! Such a great way to combine the different sets! Awesome masculine card!